A few months ago I did a painting as a gift for an acquaintance and realized how much I came to know about that person and how much I looked at her in a completely new light. I realized that doing a painting for someone really brings him or her into focus. That is when I hatched the idea to organize an art swap at the gallery/art league I am associated with. I thought it would be a good tool for a mixer….a way to get artists to really know each other better and appreciate the talents of one another. We dropped our names in a jar and I divided them up into new members and those who had been members for a longer time. Then I drew the pairs out of those two boxes. We exchange the art at a little party tomorrow evening. I drew a man who does plein aire landscapes. His wife is an avid outdoors woman who takes her husband on long hikes through the Great Smokies. Consequently, my swap partner knows the names of many little woodland flowers and shares the same joy with me over seeing them bloom in the spring. I would never have known this had I not thought up this project so I think it is successful for that reason alone. I hope other members have come to be friends. I did this painting for him of blooroot blooming in the early spring. 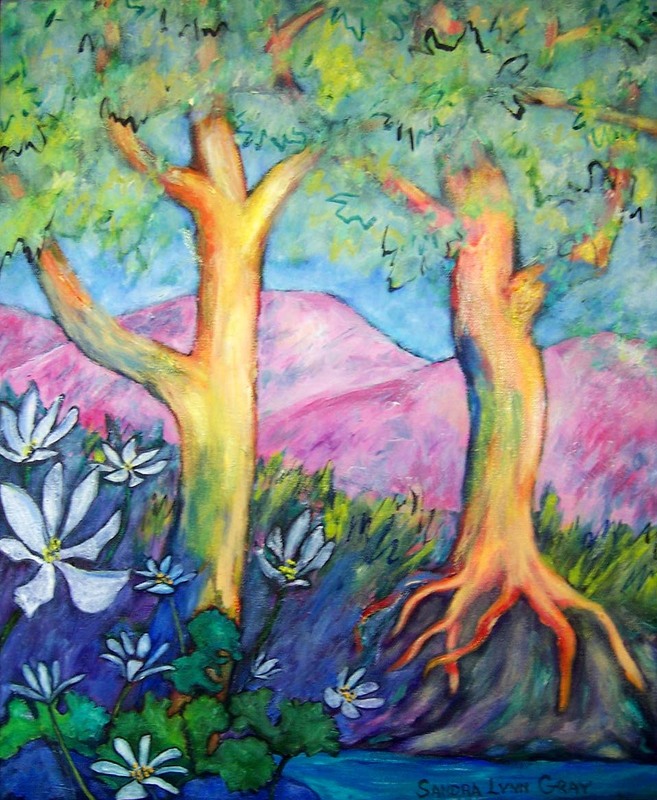 I used pink and lime green and beigy trees to represent the earliness of the spring but the ground is dark and moist as the delicate white blooms push through the humus into the spring light. The red root on one tree echos the title of the painting. It is one of my most thrilling experiences to see the spring wildflowers bloom. I am sharing something integral to who I am with another person in a rather intimate way. I highly recommend it to the rest of you artists. Tell me if you have had similar experiences. ~ by Sandra Lynn Gray on June 22, 2008. Great painting – I have a real fondness forwildflowers and this is lovely. This turned about wonderful…I hope you share his response to it. Thanks all of you for your comments. (I must learn to edit and proof these posts) I have permission to post the painting of my art swap partner. It will be up soon along with the bio and explanation of his inspiration to do it for me. This font is so small I can’t see it who knows what I am writing? Beautiful painting, I love the wildflowers of the Great Mountains as well, living here in Southern Indiana we do get a wonderful array of wildflowers but not of the mystique they carry in the Mountains. Thanks for stopping by my blog, I have enjoyed looking thru yours !